In one of my first ‘online jobs’, I worked for a Virtual Assistant agency within a team of subcontractors. Our group addressed each client’s needs based on our individual strengths and skill sets. One of my previous co-workers connected with me on LinkedIn. I was thrilled, it’d been ages, I looked forward to catching up and seeing where she was in her professional journey. Her request came across, I clicked in agreement and promptly sent her a message. I gave her same day approval AND messaged. Nothing. I like LinkedIn. I like how it’s professional and there’s hardly any happy sloth videos (which I love and is part of the problem). I can showcase my experience, have peers confirm that experience and even provide references. All things that don’t fit nearly as well on any other social profile. Let’s not fool ourselves, though. What we’re doing on LinkedIn isn’t networking. When you’re connecting without sharing why you’re doing so, you’re not networking. 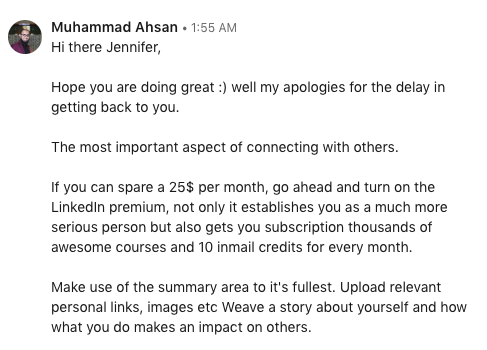 Muhammad Ahsan says LinkedIn premium is worth the investment. In order to email someone via LinkedIn prior to connection, you have to be a premium member. That starts at $35CAD per month or $420 per year, and really is best used by corporate job applicants. The $50 per month ($600/year) is better targeted for growing your business. And it’s not just me who is bootstrapping LinkedIn. Only about 15-20% of users seem to pay for premium. So, I get it, it’s tough. LinkedIn DOES give you the option of sharing a note when you press connect. You know who does that? Unicorns. And people who have a great way to earn six-figures in seven days. When you’re connecting with strangers AND not messaging, you’re not networking. At time of writing, a Documentary Filmmaker from New York with her smile hidden by a white mug would like to connect with me. Maybe she thinks I’m neat. Maybe she is doing a documentary on people who used to host trading shows on small-town radio in the 90s. I replied to this person’s request with my go-to script. He replied, but he’s neither taking me up on my offer nor offering curiousity or value in return. Thank you for reaching out. May I ask what prompted you to do so? Just because we have what amounts to as a herd of mutual friends, sending me a connection request isn’t networking. I’ve asked other online professionals how they handle social media connection requests. Many accept without questioning. I’m a rare bird, asking why before connecting. 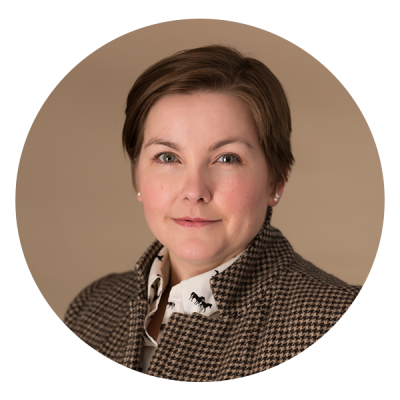 Katrina Onstad, author of The Weekend Effect notes, “we all know the glow of cyber-validation, that rush of adrenaline when the digital throng picks up your tweet and it moves across the Internet like a crowd-surfing body.” We get the same rush from being liked on social media. Ron is the real deal. 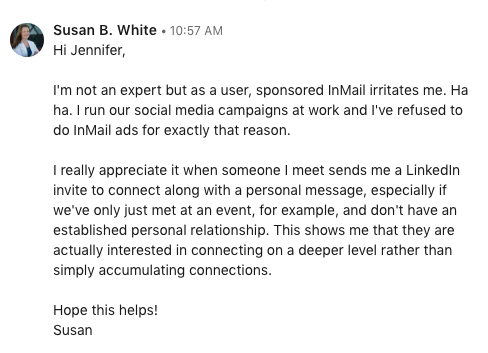 LinkedIn works – make each connection count. I’ve taken courses where the host recommends connecting with everyone and anyone on LinkedIn so you get that lovely “500+ connections” and people will believe you’re a big deal. Others argue there’s no point being on the platform if you have less than 250 connections. However, the Muse and I would argue it doesn’t matter how many connections you have if you’re not connecting. If you are using connecting on LinkedIn as a pickup line, you’re not networking. How often does that really work anyway? Two of my respondents have mentioned they’d received a connection request as a stepping stone to being hit on. One says three out of four requests for connection she gets are asking her out. Her response? The link to a more appropriate platform: a dating site. Speak to individuals; stop shouting at crowds. Send a personal note with your connection request. To write that note, be curious. Check out their profile and ask why they love their work, what experience they took away from past positions, share your thoughts on their latest article or post. Demonstrate your authority. Start posting on the topics that interest you, share your research and related articles, write your own articles and share your blog posts. Over and over again, folks said they want you to send a personal message when you connect. Be attractive to searches. If your profile is flat as a pancake, spruce it up. Use a current photo of you and not your logo as your profile pic. Add a call to action to everything you do to encourage interaction. Keywords and hashtags are searchable on LinkedIn, too. Share value. I will grudgingly give you the 80:20 rule for LinkedIn. Share 80% no-strings-attached value with your audience. And, fine, yes, you can promo your work and portfolio 20% of the time. I want you to remember that 20 comes after 80. That your first message should NOT be a sales pitch and never a mass sending. And that 100% of what you put out on the platform is a reflection of your awesomeness. 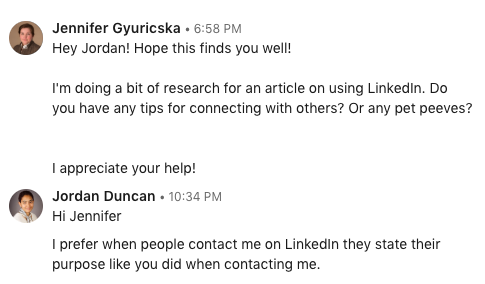 Proof in the pudding on connecting via LinkedIn in ways that work. Are you on LinkedIn? Do you have something to add to this list? 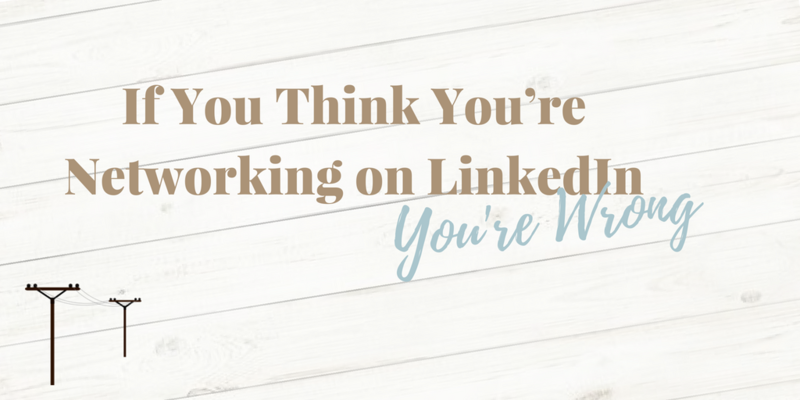 I’d love to connect with you on LInkedIn – all you have to do is reach out with a personal message and I’ll accept!